One of the things I really enjoy about homeschooling is discovering books that impact my life and the lives of my children in a positive way. Charlotte Mason encourages us to find books that are twaddle free so when I find a book that impacts me I look forward to reading it to my children. When Timothy and Jane were younger I discovered an incredibly though provoking trilogy by Patricia MacLachlan called: Sarah, Plain and Tall. Last year we worked our way through the Little House on the Prairie books and my aim was to read Sarah Plain and Tall to Nathaniel but I really wanted him to see deeper into the story. Due to him having ASD this can at times be rather challenging. 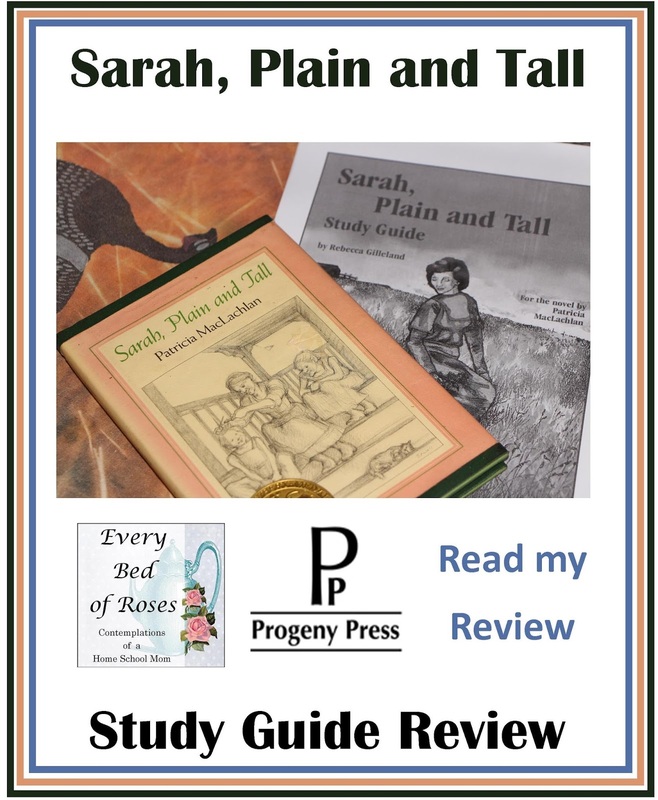 Last year Progeny Press blessed our family with a wonderful study guide to use along side Frog and Toad Together and we enjoyed it so much I was thrilled to find that they had an E-Study Guide for Sarah, Plain and Tall. Their company mission is "To teach our children to think clearly, to understand literature, and to rely on the scripture for truth and values, and enjoy themselves while they do it!" For the book: Sarah, Plain and Tall by Patricia MacLachlan. I downloaded the guide which arrived in an interactive PDF format (575 KB). It had a total of 43 pages with a full colour cover. I printed our copy at home on our printer. I also printed off the answer key (61.5 KB). Sample of questions and interactive fill in spaces. This study guide is an interactive study guide. You will need Adobe Acrobat Reader 9.0+. I wondered what they meant by interactive and discovered that students have the ability to fill in the answers electronically on the computer and save their work as they progress through the guide. You do still have the option of printing the guide as before and using it as a paper guide. We stored ours in a file. To make use of the interactive part of the guide is an easy process. You open the guide on your pc, click on the blue highlight and start typing. The blue disappears and your writing appears in a different font. Once you have filled in your response and move to the next question the blue reappears. Starting off our study we used the background information section to help us understand the time period the book is covering as well as to get a better perspective of life on the Prairie during the pioneer days in America. Sarah, Plain and Tall is a 1986 Newberry Honor book. Sir N and I took turns reading the chapters together. This is a beautiful book and thought provoking. After Sir N read a chapter to me I would re-read the chapter to him so he could sit back and enjoy the beautiful illustrations and hear the story. We then moved to the table and looked through that chapter's study guide questions. Digging Deeper is one of my favourite sections of the guide. I wanted Sir N to have the opportunity to think and share with me his thoughts so I was the scribe and reader of the guide to him. From the guide I learned to turn to God's word and dig deeper and draw parallel's to what we were reading and learning. Together we learned to think more clearly about the story we were reading together. This had a benefit as Sir N got to look in his own bible to discover more about what God said on the subject. Each scripture reference was followed with thought provoking questions to help the student dig a little deeper and apply the knowledge of what they had just learned both from the Word of God and the book they had just read. Nathaniel and I both enjoyed this study guide together. I enjoyed the digging deeper questions the most especially watching Nathaniel grasp the impact upon himself. He also enjoyed some of the further reading and listening suggestions at the end of the book. I hope that we can find the movie to watch too. This guide was easy to use and there was very little preparation work for me the teacher. I liked how the layout was easy to follow and simple to use. If you are looking for a study guide to use with your children that digs deeper and goes beyond asking mundane questions like who is the main character and what did they do? A guide that relies on scripture as the plum line. Progeny Press study guides are your answer. I look forward to using more guides in the future with Nathaniel. You're welcome Kylie. We've really enjoyed using the guides from Progeny and I am hoping to use more in the years to come.